REAL ID Update: Did You Get Your First License After 2003? If you want to get a REAL ID beginning next year, PennDOT may already have some of your information on file for more efficient processing. Earlier this month, PennDOT began sending postcards to eligible customers (those who received their first driver license or ID card after September 2003) inviting them to visit PennDOT’s Driver and Vehicle Services website to request that PennDOT confirm their documents are on file. Once a customer has completed the pre-verification application process, PennDOT staff will review the customer’s record and verify which documents are on file. The customer will receive follow-up communication from PennDOT regarding the status of their application. Customers are not pre-verified until they have completed the online pre-verification process and received confirmation from PennDOT that all documents are on file. If they are, PennDOT will mark the customer’s record as “verified,” and after REAL ID products are available in spring 2019, the customer can opt into the REAL ID program online, pay the one-time $30 fee, plus their renewal fee (the REAL ID product will include any time left on the current license plus the period of renewal) and their REAL ID product will be sent through the mail, eliminating any need for this customer to visit a Driver License Center. To help protect consumers from having their personal information stolen or used fraudulently, the House passed two bipartisan bills this week to address data breaches. House Bill 1846 would require notice within 45 days to residents of the Commonwealth when there is a breach of security of a system. The notice must be in plain language, and include the date of the breach, the type of information subject to the breach, and toll-free numbers to credit reporting agencies. Similarly, House Bill 1847 would waive the current fee to freeze a credit report, which is $10 for each request, should a data breach occur. In the instance of a data breach, consumers would be provided with three months of free credit monitoring and up to three free credit reports for one calendar year after the date the breach is reported. Consumers are urged to be proactive in monitoring their credit reports and financial account statements, such as credit cards and utilities, by clicking here. To report any suspicious activity, call the attorney general office’s hotline at 1-800-441-2555 or atscams@attorneygeneral.gov. The House Education Committee held a hearing on Thursday to examine the status of school safety in Pennsylvania. The committee will use the hearing to take a thorough and holistic look at school safety in Pennsylvania to determine if further legislative actions need to be taken, and if so, what those actions should include. The hearing was organized into four panels: Current landscape of school safety; views of Pennsylvania education organizations; national approaches to school safety; and recommendations to improve school safety. The committee not only heard about what is already being done in Pennsylvania to protect our students but also what other states have done and possible approaches to enhance school security even further. Several school safety-related bills are already before the House Education Committee for review. Southern Columbia took second place in team standings. • Congratulations to Eagle Scout Colin Hill, who earned a record 139 merit badges and created a memorial to 9/11 in front of Berwick’s Reliance Fire Company that incorporated 19 twisted steel beams from the South Tower of the World Trade Center. • Congratulations to Eagle Scout Hunter Rhodes, who worked to create a permanent flag retirement area at the Benton VFW. 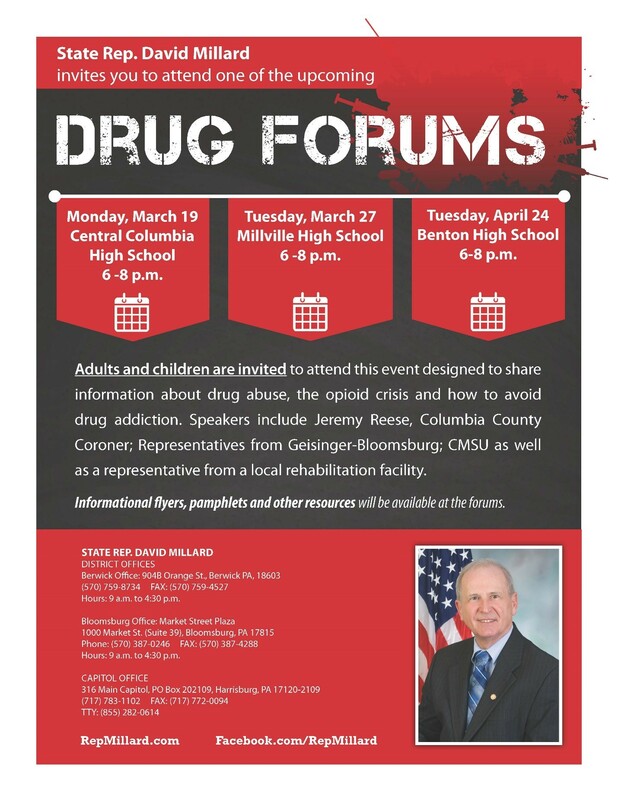 Our first spring Drug Forum will be held on Monday, March 19, at Central Columbia High School from 6-9 p.m. Adults and children are invited to attend this event designed to share information about drug abuse, the opioid crisis and how to avoid drug addiction. Speakers include Jeremy Reese, Columbia County coroner; representatives from Geisinger-Bloomsburg; CMSU, as well as a representative from a local rehabilitation facility. Informational flyers, pamphlets and other resources will be available at the forums. Everyone is Irish on St. Patrick’s Day! St. Patty’s Day festivities are filled with friends, family and social events. Oftentimes, these parties end with drunk drivers who endanger our roads. Drinking and driving accounts for nearly one-third of vehicle-related fatalities in the United States. Over the past four years, the number of alcohol-related crashes has been rising in Pennsylvania. This St. Patrick’s Day, local law enforcement will be patrolling your community to ensure citizens follow the law and refrain from drinking and driving. Doing so not only keeps you safe, but it keeps other vehicle passengers and pedestrians safe. Don’t test your luck this St. Patrick’s Day: Drive Sober or Get Pulled Over. • Always remember to plan ahead. You know whether you’ll attend a party. If you plan to drink, plan for a sober driver to take you home. • If you see a drunk driver on the road, contact local law enforcement. • See a friend who is about to drink and drive? Take the keys away and make arrangements to get them home safely. Don’t worry about offending someone – they will thank you later. • Is it your turn to be the designated driver? Take that role seriously – your friends are relying on you. This St. Patty’s Day, don’t rely on the luck o’ the Irish to get you home safely – refrain from drinking and driving. Discuss these drunk-driving facts with your friends and family, plan to celebrate safely, and spread the word about the dangers of drinking and driving. • Southern Columbia High School will be performing Shrek the Musical from Friday, March 16, though Sunday, March 18. • St. Joseph’s in Berwick will hold a craft show on Saturday, March 17, from 9 a.m. to 2 p.m.
• All are welcome to attend a Drug Forum, hosted by our office, at Central Columbia High School on Monday, March 19, from 6-8 p.m.
• Millville High School will be performing The Addams Family from Friday, March 23, though Sunday, March 25. • All are welcome to attend a Drug Forum, hosted by our office, at Millville High School on Tuesday, March 27, from 6-8 p.m.
• Monthly Radio Address: Thursday, March 29, at 8:30 a.m. on WHLM 94.7 FM. • Offices will be closed on Friday, March 30, for Good Friday.